A new dawn, or a false dawn? Well, what a season 2017-8 turned out to be. Surely none of us would have predicted a second Challenge Cup win and a return to the Champions Cup on the back of our losses to Edinburgh, Leinster, Glasgow and Munster last September. Danny and the squad have worked miracles, the growing culture within and confidence of the side has been apparent to all, and we haven’t just won games, but won them in style. The fact that over half the match day squad for the Bilbao squad came from the Academy Pathway was superb and a great confirmation of the fact that Cardiff Blues are finally delivering on the only regional metric that matters, player development. As we write, there is every possibility that Kruger’s version of Sloop John B will enter the charts at number one this week; it certainly deserves to be sung on the terraces and in stands from now on. Quite rightly, we should all take time to bask in the reflected glory of a completely unexpected but wonderful season. It would not be unreasonable to conclude therefore that God is in his heaven, and all is right with the (Cardiff rugby) world. At the time of one of our false dawns of recent years, Peter Thomas stated that Cardiff rugby would never be allowed to slip back into the second division but, as we all know, that’s exactly where we’ve been for the last few seasons. So, even though the celebratory songs are still ringing in our ears, now is exactly the time to reflect on how we build on the successes of this year. Given the budgetary restrictions on the Welsh regions, the achievements of Cardiff Blues and our friends at the Scarlets have actually been quite remarkable and are a clear example of the teams punching above their weight (or more specifically, their finances). New television deals and a potential expansion of South African interest in the Pro14 will bring additional revenue, but it is ultimately down to the WRU to back the regional teams financially and to ensure that they are more competitive going forward. The fantasy vision of the Lewis years was that you could have a strong apex of the player development triangle in the absence of a strong base. Both Gareth Davies and Martyn Phillips are far too astute to share this dysfunctional perspective, and so hopefully the new rugby agreement will see this issue properly addressed, together with a more coherent structure below professional team level. So far, the noises seem positive. Long term success on the field won’t be achieved unless certain other risks are also addressed. A critical consideration is that we are losing two architects of our current success, with both Danny Wilson and Matt Sherratt moving on. While we fully support and welcome the introduction of John Mulvihill and his new team, losing such quality coaches is an own goal and one that the Cardiff Blues Board needs to take full responsibility for. We have written many times about the need for changes in the governance of the club, but turkeys don’t typically vote for the festive season and it would appear that changes in governance will only occur if they’re externally driven. That might not be too far way, as it seems likely that any improvement in financial support will come with conditions. What a positive statement it would be though for the club to make changes to its governance without a financial gun being held to its head? It has a real opportunity to show that it can become a progressive entity rather than simply being a dinosaur waiting for the meteor to hit. Establishing a skills-based board rather than a rich man’s club would be a major step in capitalising on our new-found success and give a strong message about our intended direction of travel. As we know, Mulvihill comes highly recommended. John was in town this week on a reconnaissance mission, and it will be fascinating to see how he and his new team build on this year’s triumphs. One of his reputed attributes is a real ability to develop and nurture new players, so it could be a perfect match given the (mostly) youthful nature of our squad. How the players react to him will be crucial. Let’s not forget the rein of Mark Hammett who it’s thought had little support from the Board when some players didn’t respond positively to his methods. While Mulvihill’s ability as a coach is yet to be established in our eyes, it is already evident that he is a shrewd judge of real estate. Whilst the legend that is CAP captivated him from a distance, the reality has now become fully clear to him (including the observation, allegedly, that parts of it ‘stink of piss’). This brings us naturally to the paradox between the on-field triumphs and abysmal lack of off-field progress. Despite the flurry of activity, claim and counter-claim of last February, there would appear to be no movement of any note in terms of agreeing a new lease and redeveloping the ground-which is absolutely appalling and unacceptable. The people who pay money to go through the gate are totally hacked off at this inability to progress a deal and surely deserve better. 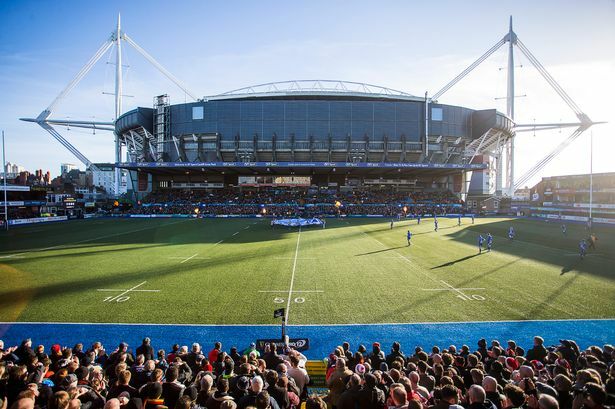 It is more than ever apparent that the two key players- Cardiff Blues Limited and Cardiff Athletic Club- want the same thing, namely for CAP to remain the home of professional rugby in the City and for a new short-term lease to be agreed while the bigger picture is resolved. As we’ve stated previously, there are obvious faults on both sides, but it should not be beyond the wit of the two groups to agree something that they both want. It’s not just the tenant and landlord that want to see a deal. CF10 has, much to the annoyance of some, spent a good few months lobbying the local council and MPs. Guess what? They also want to see a deal done. At the moment, an undeveloped CAP risks being a residual eyesore within a substantially redeveloped central city area and along what is primary artery into the capital. Developing the CAP also has to be of interest to the WRU, not just in terms of possibly closing Glanmor’s gap, but also in terms of being able to fully realise the non-match day commercial benefits of the Principality Stadium. Given that CB Ltd. and CAC seem unable to span the chasm between them, perhaps it is the WRU and local authority that needs to act as a facilitative bridge. We’ve certainly suggested as much to the latter and are optimistic that this might indeed be the way forward. Central to any resolution would appear to be the RFC deciding where and what it wants to be. It’s a challenging time for semi-professional rugby with the introduction of the under-23 sides/A teams and the likelihood of an amateur(ish) Premiership. Making any kind of concrete plan is difficult amidst such turbulence, but this cannot be allowed to hold up developments ad infinitum. Our personal view is that the RFC’s future would be more assured being more closely linked to the professional team rather than being cut adrift from it, but the RFC committee may decide otherwise. Whichever route is chosen, it cannot continue to stall progress. CAC itself needs to develop a sense of urgency and also clearly formulate what it wants out of the deal. At present, its representatives on the Cardiff Blues Board appear to act unilaterally, which is completely ridiculous but perhaps understandable in the absence of a clear mandate. The CAC Management Committee is somewhat incredibly now not meeting for two months-unbelievable! A key point to note is that, as was seen at the RFC member meeting called earlier this year, most RFC members would now appear to be Cardiff Blues Season ticket holders who pay £50 for the privilege of drinking in the clubhouse of match days rather than die-hard RFC fans. In the continued absence of any discernible progress, perhaps a rugby section or CAC EGM needs to be called and for us to be able to receive a direct account of what is and what is not going on and for key players to be held to account. Organisations only achieve sustained high level success when everyone works to the same goal, people are clear about their roles and they work as one. At the moment, we are still a long way for this situation. For the professional team to have achieved what it has this season is indeed remarkable, but it only provides an increased potential for further success. Realising that potential requires significant change in many areas at CAP. After a very lean period, the fans deserve to see a genuinely new dawn rather than another false one. All the key players at CAP need to take a long look at themselves and ask, as we’ve suggested previously, ‘Am I part of the solution or part of the problem’. If the latter, it’s time to move aside and allow others a chance. i think what I’d like to understand is what CAC want? Because they surely gain most revenue from Cardiff Rugby clubs paying rent?! If a viable alternative can be found centrally, maybe there hand will be forced. But ultimately I think CAC is run by amateurs? I might be wrong. Brilliant article. I couldn’t agree more with the sentiments shown and suggestions made. CAC and particularly the rugby section need to get a sense of urgency as if CBs are forced to find a new home then they , CAC as people purportedly concerned with the preservation of the heritage of CRFC may be presiding over its demise..